Two SNP North Lanarkshire councillors have resigned from the party amid a row over candidate selection for the General Election. Alan Beveridge and John Taggart stepped down after complaining about how Westminster candidates were chosen. North Lanarkshire voted in favour of independence in the referendum last September and could be a key target for the party in May. A spokesman for the SNP thanked the two men for their service. 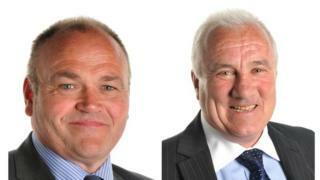 He said: "We'd like to thank the two councillors for their public service to date, and wish them well in the future. The North Lanarkshire SNP council group will continue to work hard to serve their constituents and local communities." Mr Beveridge, who represents the Airdrie North Ward, and Mr Taggart, who represents Murdostoun, will continue to serve as independent councillors at the Labour-led local authority. Mr Beveridge told BBC Scotland he decided to resign as he was unhappy with the way SNP head office dealt with his complaint about candidate selection. In his resignation letter he said he had "been alarmed by the climate of fear, intimidation and false allegations which operates within the SNP locally". North Lanarkshire voted for independence by 51% to 49% in the referendum on 18 September. Turnout in the area was 84% with Yes winning by 115,783 to the No campaign's 110,922. North Lanarkshire includes the constituencies Coatbridge, Chryston and Bellshill, Cumbernauld, Kilsyth and Kirkintilloch East, Airdrie and Shotts, and Motherwell and Wishaw - all currently held by Labour. How do people in Motherwell feel one month after Scottish referendum result?